How To Check Fake Company? How To check Saudi visa is original or fake? A LOT OF EMAIL FRAUDS ARE OBSERVING TODAY .UNKONWN MAILS ARE HUGE.ASKING US TO PAY SOME MONEY AND THEN THEY ARE SAYING AFTER PAYMENT THEY WILL PROVIDE OFFER LETTER TO YOU. SO THIS METHOD HELPS TO FIND FAKE EMAIL ID’S.HERE AM GIVING SOME TOOLS AND SOFTWARES SO YOU CAN FOUND EASILY THAT EMAIL ID IS WORKING OR NOT…CHECK THIS LINK .JUST OPEN THE LINK AND SUBMIT THE EMAIL ID IN THE GIVEN BOX. CLICK VERIFY BUTTON .SO YOU CAN OUTPUT.FOR MORE INFORMATION YOU CAN READ THIS ARTICLE FOR MORE CLEAR . NEXT GO TO THE LOCATION DETAILS.USE GOOGLE MAPS TO CHECK THE LOCATION AND YOU CAN VIEW THE BY USING GOOGLE EARTH. SIMPLE STEPS TO USE GOOGLE EARTH.GET COORDINATES FROM GOOGLE MAP.HOW TO GET CHECK HERE. SUBMIT THE COORDINATES IN THE GOOGLE EARTH. THEN YOU CAN VIEW ENTIRE COMPANY PICTURE IN THE GOOGLE EARTH. BY USING THIS INFORMATION AND TOOLS YOU CAN IDENTIFY THE COMPANY DETAILS.AND CROSS CHECK IS THAT GENUINE OR FAKE.SO IF THE DETAILS ARE MISMATCHED SO YOU CAN DIRECTLY RAISE A QUESTION.BE SECURE BEFORE SUBMITTING YOUR PASSPORT. SIMPLE TOOL TO IDENTIFY FAKE JOB POSTINGS AND FAKE COMPANY NAMES IN THIS ANY DOUBTS COMMENT BELOW. THESE SITES ARE HELP US TO TAKE REVIEWS ABOUT COMPANY.SEARCH FOR REVIEWS SO YOU GET SOME IDEA HOW THE COMPANY TREATED US. Gulfjobmag is fake don’t go in that hope u understand. I got a offer letter to work in KNPC, Kuwait. through a CONSULTANCY from Kolkata. I never attended interview and interacted face to face. but they had sent me offer letter based on my RESUME and CERTIFICATES. How can i conform that the offer letter is REAL / FAKE. It is fake . Don’t believe that . 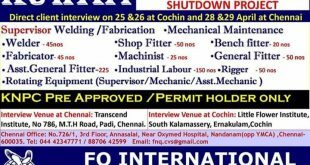 Without interview no offer …. How about this jobgulfmag.com this is real or fake. because they offer free ticket free visa no money involve and all you want to do is send resume and after that cv selection.but i doubt that because when i seacrh this in the google if they have no lisence and not accredited but in facebook they active everyday posting going to canada, singapore, newzealand ,denmark and many more.pleasevisit facebook jobgulf magazine and please can you tell me thats fake or real thank you very much and Godbless. It is a fake site don’t believe in that …they won’t mention any contact address to get those jobs…. If my name appears on the list, would I need to pay huge money to the consultant to process my visa? Can an unemployed afford this? Told me that they never ask for money,fee,or other amount. They write that free visa free air ticket and accommodation. And I don’t know what can I do! In every site that register it was be fake site. I have never a good chance to get job! Can you tell me it is fake or no ? If know a real site to get job without money please aware me this is my e-mail address: latifamani999@gmail.com. Have a good time dear friend. Thanks a bundle to help people? I have a offer to oman visa for engineering job in muscat, they asking to my original diploma certificate to visa processing to send through courier to oman place. I want to information regarding to orginal certificate need to visa processing for oman jobs.other country is need only scanned copy . they help me to get job in abroad..
may i know your basis that gulf job mag is a fake?please give me a proof please. gheewala and jerry Verghese are the best consultants. I received an offer letter from Al Throm construction group Kuwait after a short Telephonic Interview through a consultancy in Tripura. The phone number is same as that mentioned on the http://www.thromconstruction.com and also the mail id from which I received the offer letter has the same domain name as company name. Now I’m really concerned about the authenticity of the job offer.. Please help me as soon as possible so that I can make a timely decision about the process. Moreover the consultant is asking to deposit some service charges or submit original document so that they can start the process of visa.. I received an offer letter from Al Throm construction group Kuwait after a short Telephonic Interview through a consultancy in Tripura. The phone number is same as that mentioned on the thromconstruction .com and also the mail id from which I received the offer letter has the same domain name as company name. just submit xerox copies of your documents….once you receive visa then do the payment…If they do not agree on this better leave this opportunity. Same process with me.. Aravind Have you got visa.. Plese tell me about… As soon as possible. Plz contact 9876326029 … A whatsapp group has been created for further info. pls sir i want to know if in4everything.com is legit cos they advertised jobs woth free visa, free ticket, food and accommodation. Can someone tell me if Johnsons Careers is real or fake . They don’t ask for money but they want documents you have to pay for to Richmond document services via western union. I am looking for a job in Canada. Can you please tell me the best agency in Chennai. Address: G-B Ashirwad, No.3, Mc Nichols Road, Chetpet, Chennai, Tamil Nadu 600031. My name is Surendra. I have to known my cv is suitable to apply jobs in Canada or other countries. I have nearly 4 years experience in f&b (s) as a waiter and guest expert in Ramoji film city and Kfc restaurant in India and Kuwait respectively. I completed my graduation in Bsc computers. This is about me. Please tell me any trusted consultancy in Andhra Pradesh state and telangana state specially in Canada or Europe country consultancies. Check your visa number in online.. I got offer letter from alzafar company Jordan for their upcoming project Qatar. Employer called from net number and demanding pay money to consultancy before visa. Is any body get qatar visa to Alzafar company?